I was a little late to this particular party. 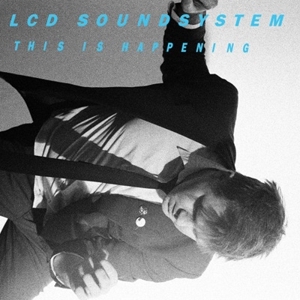 For years I assumed any band that called itself “LCD Soundsystem” would make some kind of crappy techno that I would have no interest in. But I kept hearing about them and by the time I finally decided they were worth checking out, mastermind James Murphy was on The Colbert Report saying that this was their last ever TV appearance. A farewell concert is scheduled for April 2 at Madison Square Garden, and while the temporary retirement has become a fairly standard music biz tactic, Murphy seems sincerely tired of the rock’n’roll treadmill. So there’s a decent chance he means it. But can you tell me what’s real? Of course, this is a man who owns his own record company, so I’m not sure who’s leaning on him. Maybe Richard Branson, whose Virgin Records distributes Murphy’s DFA Records? Branson did once try to make Johnny Rotten the lead singer of Devo (true story). Anyway, while This Is Happening is indeed some kind of techno, it’s mostly the kind I like – i.e. technopop, in the best sense of the word. Murphy is a few years younger than me but he clearly grew up listening to all the same music I did: Devo, the Cars, Depeche Mode, New Order, Ultravox, etc. etc. And of course Mr. Bowie. There’s also a distinct Kraftwerk/ Krautrock influence in the form of chugging, hypnotic rhythms and slow-building songs that stretch out over 7, 8, 9 minutes. But LCDS is not just the sum of its influences. There’s something different about them (or is it him, since Murphy plays about 90% of everything?). Something…perverse. Case in point: The leadoff track, “Dance Yrself Clean,” begins as three minutes of spare percussion and lingering synth notes over which Murphy chants cryptically. You turn it up to try and figure out what he’s saying, and then the booming bass track kicks in, hurting your ears and perhaps blowing your speakers. It stays like that for a few minutes and then returns to the original sound, making you want to turn it up again so you can hear what he’s saying about the Marxists, but a little afraid to. Also perverse: Murphy can really sing, but he tends to bury his voice in the mix and/or sing in a willfully constricted style. He finally lets it out of the bag for “I Can Change,” which is a great song, reminiscent of the precisely tailored style of Vince Clarke (sonic architect of the original Depeche Mode, Yazoo, and later Erasure). One little complaint, though…”I Can Change” makes sense as a single in the 4 minute version I saw on Colbert (see below). The album version wears out its welcome a bit at 6 minutes, and it’s the shortest track here. Pretty much every song could use a little trim; I suspect this is a byproduct of working mostly as a one-man band. For that matter “Pow Pow,” at 8:23, could be at least 8 minutes shorter; it’s one of the most annoying things I’ve heard in years. This may not be an accident, though. There are mixed messages all over This Is Happening; every moment of grace is counterbalanced by a slap in the face. I don’t know if this is integrity or willful self-undermining, a generational shortcoming with which I am not unfamiliar. This entry was posted	on Wednesday, March 9th, 2011 at 11:43 am	and is filed under Dancing about architecture. You can follow any responses to this entry through the RSS 2.0 feed. You can leave a response, or trackback from your own site. I was drunk through all of the eighties for a reason. This song reminds of what it was all too clearly.